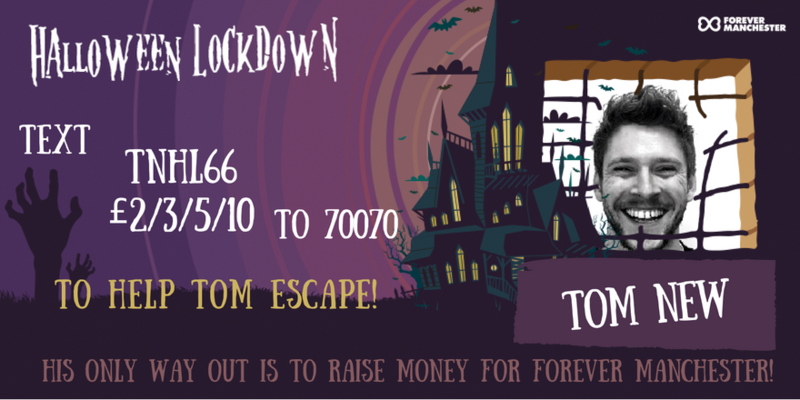 Manchester personalities will face the dark and depraved ghosts of Manchester on All Hallows’ Eve to help raise money for Forever Manchester. A group of brave ghost hunters will gather in the bowels of Old Granada Studios on Saturday 29th October to expose the dastardly goings on of Manchester’s undead whilst simultaneously raising cash for us. Their only way out is to get friends and family to raise as much cash as they can for Forever Manchester. 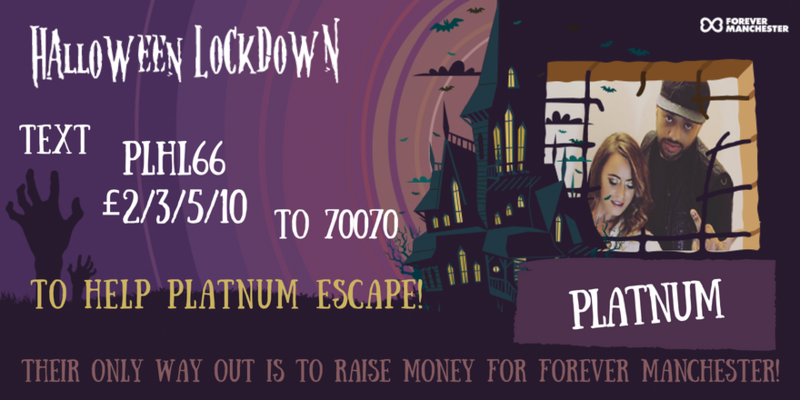 Depending on how much money is in each competitor’s JustGiving account – they will either be released and whisked off to Forever Manchester’s Halloween Spooktacular at Old Granada Studios to party the night away, or they will be locked up for even longer until the last man or woman standing is solo – spooky! Guiding the group on their perilous ghostbusting journey will be resident ghost hunter Stuart Marshall, working to find out exactly what is behind the recent spate of unexplained paranormal activity at this city centre location. Ghostbuster Stuart has visited over 100 haunted locations all over the UK and has spent years searching for evidence of ghosts, spirits and other entities. 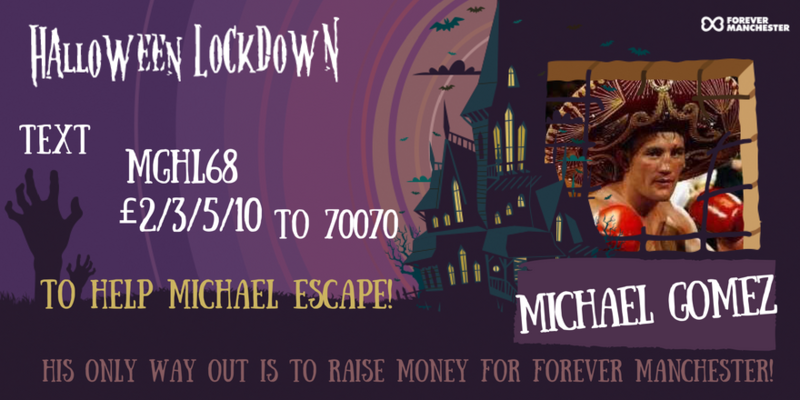 Last year, he conducted the Lockdown for Forever Manchester underneath 53 King Street (and the year before in The Corn Exchange) – giving him plenty of experience of Manchester spectres! Each contestant will be ghouled up by Greater Manchester based make-up artist Grace Eve, find out more about her on her Facebook page here. This will be her second year supporting the Forever Manchester Lockdown. Scott is one of the UK’s leading entrepreneurs and was recently awarded an MBE for services to business and the community in the North West of England. While he now heads up companies with a total valuation in excess of £150m, he founded what is now his largest business, ANS, when he was just 22 years old. Scott’s active charitable involvement, passion for Apprenticeships and support of young people in the local community makes Forever Manchester a perfect charity choice for Scott. 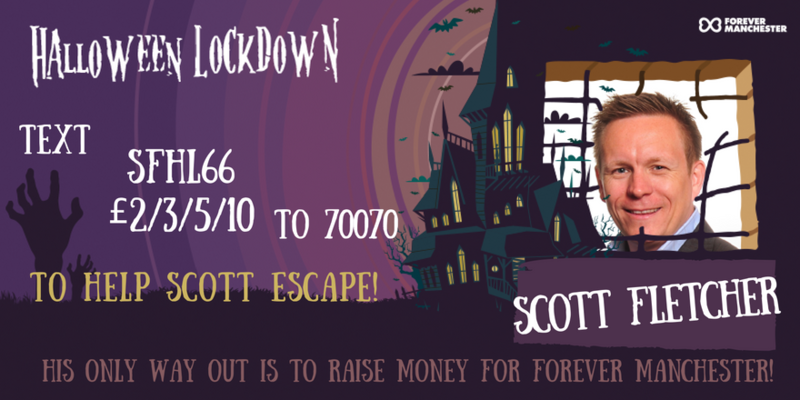 ANS are our main event sponsor for our Halloween Spooktacular – so let’s hope Scott will raise enough to be let out early to enjoy it! Scott’s favourite Halloween-related film is Nightmare on Elm Street. Andrew is famed across the city for creating the perfect ‘barn/it’ , and is just about to open a 5 floor super salon on John Dalton Street with his husband Michael in early November. Andrew now has an almost cult following ranging from A-list celebrities to royalty. He was born in Derbyshire and is now an adopted manc having lived here for over 16 years. 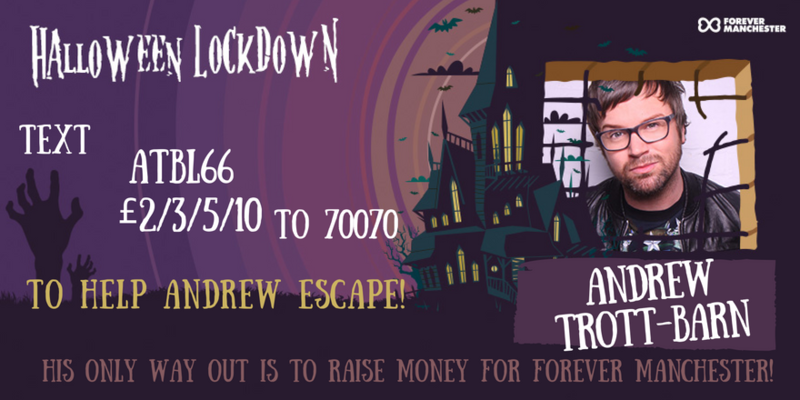 Andrew is also the creator of The Mirror Ball and Halloween Spooktacular (for which tickets are still available!) which have now raised over £250,000 for Forever Manchester to reinvest into the communities of Greater Manchester, which is absolutely incredible. 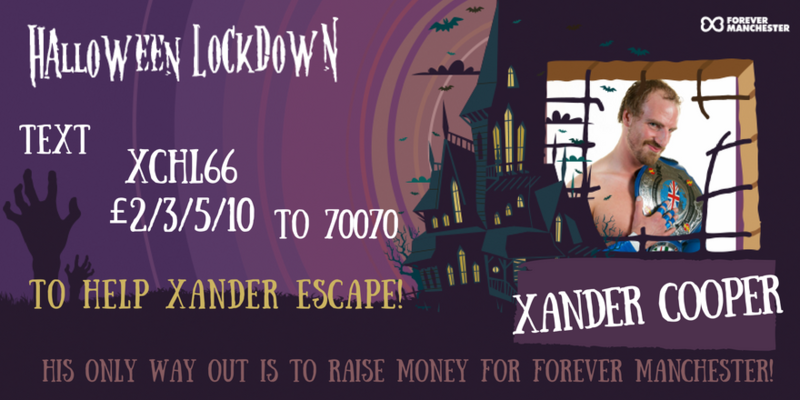 Andrew’s biggest fear is being left alone in the lockdown…. so he urges you TEXT and DONATE now! Tom is the Co-Founder of Formisimo, a Manchester-based technology start-up. He has known Forever Manchester for ages and thought it was about time to help a fantastic local charity by taking part in one of our brilliant events. Tom’s biggest fear is being thrown into a pool full of spiders, well, that and sitting on the loo before realising there is no toilet paper… yikes! Faye Brookes graduated Guildford School of Acting in 2009 after completing a BA Hons in Musical Theatre. She is currently known for playing Kate Connors in Coronation Street and has also had roles in BBC productions as Frankie in Our Zoo and Helena in Atlantis. 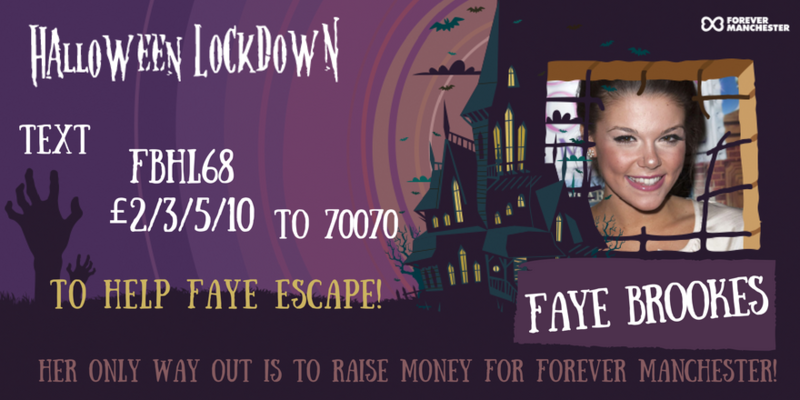 Faye’s no stranger to haunted theatre stages – let’s see how she fares at Old Granada Studios! Xander works full time as a Professional Wrestler, best known for his appearances at FutureShock Wrestling in Manchester for whom he is their Ambassador. Platnum are a Bassline /Garage vocal group from Manchester, consisting of male singer songwriter Aaron Evers and singer & rapper Michelle McKenna. The duo is best known for providing the vocals on H “Two” O’s 2008 single, “What’s It Gonna Be?” which reached number two in the UK. Their second single ‘Love Shy” was released shortly after and continues to be a favourite on the club scene. Having just finished the their Its “About Time Tour” including a few support gigs for Craig David they have just been back in the studio finishing their new EP and have confirmed a big tour with dates to be released very soon. Both believe in the paranormal and have had several paranormal experiences, so let’s see if they attract any spooky activity on the night! Michael Gomez (born Michael Armstrong), also known as “The Irish Mexican” or “The Predator”, is a former professional boxer. He was born to an Irish Traveller family in County Longford, Ireland, before moving to Manchester with his family at the age of nine. Shortly after arriving in Manchester the legendary boxing coach Brian Hughes took him under his wing and he started his boxing training at Collyhurst and Moston Boys Club. Gomez went on to become one of the greatest boxers Manchester has ever produced amassing a number of championship title belts, the IBF Inter-Continental featherweight title and the British WBO Inter-Continental, WBA Inter-Continental and WBU Super Featherweight titles. He is also an outright winner of The Lonsdale Belt. Gomez took the surname Gomez after his childhood hero Wilfredo Gomez. Gomez is now retired and trains young up and coming boxers and has just finished writing his Autobiography. He believes in the paranormal in a big way!